Posted by Anthem Hayek Blanchard // August 3, 2015 // Banking, Business, Gold, Money & Finance. A fantastic video by Learn Liberty paints the difference between capitalism and cronyism or corporatism in today’s economy, while offering a solution. Posted by Michael Scott // July 31, 2015 // Business, Money & Finance. Author and businessman, Tim Brown, knew what it was like to live The American Dream. But then everything came crashing down. A number of years ago, amidst his struggling marriage, the collapse of his ventures and his declining health, Tim contemplated ending his life while on a business trip. He spotted a location on the roof of the hotel he was staying and pondered his jump. 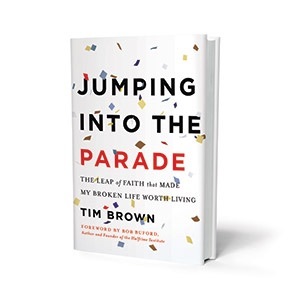 In a fascinating interview I did with him – which captures the essence of his book Jumping Into The Parade: The Leap of Faith that Made My Broken Life Worth Living - Tim discusses how these struggles helped him truly live, take chances and become the person he really wanted to be. I think there are a lot of messages baked into that question. For starters, I believe the real problems we face can’t be fixed with money. This is something that we all learn at different points in our life. Just looking back at becoming a millionaire at 30, I am often reminded that whenever you connect your worth to a scoreboard, you have fallen into a really dangerous trap. So where did ‘money’ come into this equation? Personally, making money was never about me being rich, and it still isn’t. It has always been about not being poor. Those are two very different mindsets. Glad to. As I look back, I can honestly say that money for me was about security and safety. So much of my life was based on choices that my parents made, involving frequent family moves which left me feeling unsafe and disconnected. To me, money represents the type of security and stability that has allowed me not to be at the mercy of another person’s decisions. Moreover, it helped set the course for my own value proposition here on earth in that it kinda proved to the world that I had worth. And as I recall from the book, you struggled with depression? I sure did. The depth of this depression hit me hard when I was in my late 30’s. Everything I had worked on in my 20’s was successful. And I also did really well with a lot of what I worked on in my 30’s. 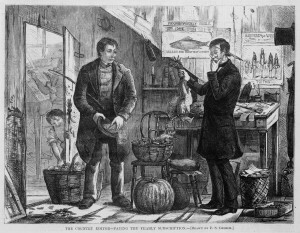 But then the demands of my businesses really started to take their toll, and it was only a matter of time before the powder keg went off. It is important for all of us to remember that our self-worth is not necessarily connected to our work life. Your worth is about your character and your capacity for learning, serving, helping others and growing your soul. It can be a real wake-up call when we find that the pot of gold at the end of the rainbow is empty and that we have spent much of our life being on this quest. For me as a kid, I envisioned marrying a beautiful wife, having a family, a great house and security and that all of this would be delivered through money. While money certainly helps for sure, I’ve seen just as many people with a lot of money live unfulfilled lives. It can corrupt people because they let it become their God. And it can become an enabler of ego which can cloud one’s judgement and humility. Posted by Michael Scott // June 28, 2015 // Business, Individual & Economic Liberty, Money & Finance, Taxes. When we hear the word “taxes” it immediately captures our attention. For some, it conjures up fear and dread. But according to tax expert Tom Wheelwright, the word represents significant financial advantages for those savvy enough to capitalize on key provisions in our tax law. As a tax authority and Rich Dad Tax Advisor, Tom is fond of a saying espoused by Robert Kiyosaki, author of the book Rich Dad, Poor Dad. Robert says, “Debt and taxes will make you rich.” Following on this point, Tom recommends having a great tax advisor who is knowledgable about tax law and real estate investing. 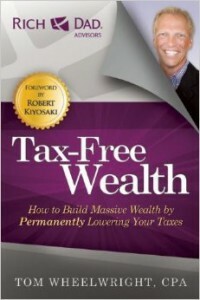 In his book Tax Free Wealth, he offers a treasure trove of strategies that create tax favorability for your business and personal income. Tom is CEO of ProVision Wealth where he and his team works with successful small businesses and entrepreneurs in 30 countries, helping them build long-term sustainable wealth. He is a frequent speaker for groups both nationally and internationally and has been featured in Accounting Today, Investors Business Daily, Deseret News National, and CEO Blog Nation. I had the pleasure of interviewing Tom for this piece, and found his approach to taxes and wealth building to be quite refreshing. Check out the discussion below for his no-holds-barred thoughts on how we can keep more of what we earn personally as well as in our businesses. Tom, what prompted you to write a book on taxes, of all things? [Chuckle] It seems like wherever I turn, I tend to hear about the tax law being bad and terribly complicated. Posted by Anthem Hayek Blanchard // June 18, 2015 // Business, Finance, Global Finance, Government, Money & Finance. 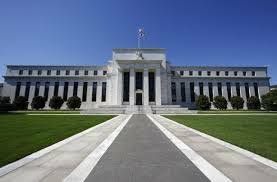 The Federal Reserve and FOMC concluded their two day meeting on Wednesday and announced they would be keeping interest rates near zero. This was expected, of course. What is causing anxiety for market participants is the continued question of when the rate hike cycle will actually start. Today’s decision continues to drag out the anticipation and fuel the debate. In this article, we will first look at the facts of today’s announcement and then analyze the options the Fed is currently facing and the implications for the markets. Posted by Michael Scott // June 16, 2015 // Business, Individual & Economic Liberty. With free enterprise, economic freedom and asset management being such hot topics these days, growing numbers of entrepreneurs are setting up corporations here in the U.S. and abroad. In my opinion, there is no better authority on the rules of the corporate-formation landscape than Garrett Sutton. Garrett is an attorney who has been in practice for over thirty-five years, assisting entrepreneurs and real estate investors globally in protecting their assets. Garrett has the distinction of being a part of an elite group of Rich Dad Advisors, through best-selling author Robert Kiyosaki, who is known for his perennial best-selling book, Rich Dad Poor Dad. 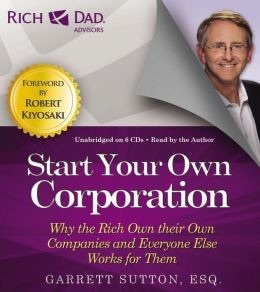 I reached out to Garrett after reading his book Start Your Own Corporation, and he was kind enough to grant me 45-minutes of his time to talk about current and emerging trends concerning business formation. Below is a Q&A transcript of our discussion. Garrett, thank you for your time. Can you briefly start off by telling us a little about your journey into the world of corporate formations? Michael. My journey began in Northern California where I attended U.C. Berkeley for undergrad before heading over to Hastings College of Law in San Francisco. After becoming a California attorney and determining that the Bay Area was becoming too crowded for me, I decided to move to Reno, Nevada, and take the bar exam there so that I could be closer to Lake Tahoe, one of my favorite places. I’ve always had an interest in corporations, but I found there were a lot of people who really didn’t understand them. So in addition to starting my law practice, I decided to write a layman’s guide to corporations. As I was starting to write the book, I became acquainted with Robert Kiyosaki and the Rich Dad/Poor Dad group. My book then became a part of their series. I’ve actually read Robert’s book Rich Dad, Poor Dad years ago, when it was on the way to becoming a bestseller. That’s great. I have to say that being associated with Robert and his positive message of financial independence has been a huge boon for me personally. This connection with him has really helped my book – Start Your Own Corporation – gain credibility with a fairly wide audience. In Chapter 2, entitled Good Entities, you break down the various types of business entities and their pros and cons. Can you offer a brief overview of this? Sure. When I travel around the country and around the world, I like to frame entities as The Good, The Bad and The Ugly. The Bad is the sole proprietorship. The Ugly is the general partnership where liabilities often exist times-two. In the book, I encourage the use of good entities, which are S and C Corporations, LLC’s, and LPs which stand for Limited Partnerships. The reason they are good, Michael, is because these good entities provide the owners with limited liability protection. This is the asset protection you want when doing business because, unfortunately, lawsuits occur all the time. So what’s so bad about a sole proprietorship or general partnership? Michael, the bottom line is that operating as a sole proprietorship or general partnership leaves all of your personal assets exposed. Setting up an LLC, a Corporation or LP, allows you to protect your personal assets – like a house or a car – from being exposed to a claim against your business. So that’s why I always encourage people to use the good entities. Does this hold true even for new business owners who are just starting out? With all due respect to the accounting field, you often hear CPAs tell their clients that are just starting out that they really don’t need to set up a corporation or LLC. I personally disagree with that type of thinking because even though you are just getting started, the risk of getting sued is still there. And if you are the sole proprietor and someone sues you, a judgement can be renewed against you every seven years. So if you set up a good entity like a corporation or LLC from the start, you can prevent that from happening. This is why I always encourage people, even if they don’t have a lot of income at the start, to use a good entity. I remember reading in your book about the various corporate formalities involved with managing a business. So what does a new business owner need to remain mindful of? You raise a key point. When you separate yourself personally from the business, you have to follow the corporate formalities dictated by the State you filed in. This typically involves paying the necessary fees each year to the Secretary of State’s office and maintaining annual meeting minutes. Moreover, it’s important for contracts and agreements to be signed in the name of the business. In other words, shouldn’t sign a contract with just your name; you sign it with your name as “President of XYZ Corporation, Inc.” For at that point the world knows that they’re doing business not with you the individual (where you could be personally liable), but rather with the corporation which gives you limited liability protection. As I understand it, there are also different tax ramifications associated with these various types of entities. What can you share here? My Rich Dad Advisor colleague, Tom Wheelwright, gets into this whole area in his book Tax Free Wealth. But let me say this, as a business owner, it’s important to have a team of advisors to guide you through all of this. Here you have an attorney giving you the asset protection advice in collaboration with a CPA like Tom who delivers the tax advice. They need to come to the table as a team, working to ensure that you’re getting sound advice. I’ve noticed that there has been a proliferation of online businesses offering to help a newly minted business owner incorporate in any one of the 50 states. What do you think of these? That’s a good question. I would say at the start that a prospective business owner needs to exercise a bit of caution here. I’ve seen situations where people have received bad advice on what business entity to use, which can have major ramifications down the road. In fact, in my book I caution readers that sometimes these services don’t offer everything needed to get set up correctly. While the price may be cheap, it may not provide the full measure of corporate formality you need. So just be careful when utilizing one of these services. Garrett, there is much discussion about the value of setting up a corporation in states like Nevada, Wyoming, Delaware, South Dakota and Texas. What’s the story here? One of the trends we’re seeing across the nation is that courts are not giving protection to the single member LLC, particularly when that business owner owes money to someone else. However, there are five states that continue to protect single member entities: Nevada, Wyoming, Delaware, South Dakota and Alaska. So setting up entities in these states will continue to be popular. What about the expense associated with setting up an entity in a particular state? The State of California definitely stands out in terms of cost, as they are the most aggressive at collecting their annual $800+ franchise fee. In fact, even if you are from out-of-state, and you do business in California, you will likely see a bill. This has become an expensive proposition for those California residents who own a lot of state entities as well as entities outside of the state. So any time you have a California resident doing business outside of California, or a resident outside of California doing business in California, there is much more extra planning needed to meet California’s requirements. In general, filing fees amounts vary from state to state. Nevada just raised theirs, but at the time of this interview, we don’t know how much it’s actually increasing. Wyoming, which is a very good state in terms of it’s protections, is only $50 per year. So you kind of get to pick and choose where you want to get set up. So how does it really work if a business owner has an entity in one state but chooses to have a second entity in another? Here’s how this works. Let’s say you have a Colorado LLC but because Colorado is not the strongest asset protection state, you choose Wyoming which is far better. There are two ways to do this. One way is to establish a Wyoming LLC and qualify it to do business in Colorado. That would require you to pay the Wyoming corporate entity fee and then pay the Colorado Secretary of State for permission to do business there. Another way to do it is to set up the LLC in Colorado, pay the Colorado filing fee, but have the Colorado LLC be owned by a Wyoming LLC. This scenario offers far superior asset protection than having a single entity here in Colorado. In your book, you talk about a concept called the “corporate veil” where you underscore the importance of following proper incorporation formalities. Can you walk us through this? Sure. The corporate veil is what protects you as an individual from being held responsible for the corporation’s liabilities. So let’s say you enter into a business deal through your corporation and the corporation gets sued. If you follow the formalities, then that’s where the suit ends. On the other hand, if you don’t follow the formalities, the veil of protection between the corporation and you as the individual falls apart, and the person suing the corporation can get through to you, the individual. What type of formalities are required? These formalities include maintaining annual minutes, where each state requires you to have a meeting once a year and a record of the meeting minutes. You also have to pay the annual filing fees to the state as well have what is know as a registered agent that resides in the state. Then there is the issuance of stock certificates, a requirement that not everyone follows. It is particularly important to issue these stock certificates to keep the corporate veil in place. Often the IRS is all over those entities that don’t issue stock certificates or haven’t kept meeting minutes. So how concerned should a business owner be if they haven’t followed these formalities? Well, let me put it this way. If you fail to follow these formalities, the veil of protection comes down, and you can be held personally responsible in the event of a lawsuit. The fact that the percentage of successful veil-piercing cases is 50% suggests that business owners need to pay close attention to this. I’m curious as to whether assets like physical gold and silver can be protected through corporate formation? We have a number of clients who have bullion – physical gold and silver – and that’s very easy to record as an asset through an LLC. I also know people who have auto collections, trademarks, and patents recorded in an LLC. So there are a number of ways to use an LLC to protect personal assets. And here again, it is particularly helpful to have this entity set up in a protected state like Nevada or Wyoming. In closing, can you offer a few ‘crystal ball’ predictions in terms of emerging trends in the business formation space? I hope my crystal ball is not cracked [laughter]. The trend that I mentioned earlier about the decline in asset protection among single member LLCs is one that I think will spread. We are keeping a close eye on this and have alerted our clients so that they are aware. Another trend I think we’ll increasingly see are states like Nevada raising their filing fees because, frankly, I don’t see states becoming less hungry for tax revenues. At the end of the day, I hope there continues to be an interest in corporate formations and entities because we need people starting businesses and employing their fellow Americans. That’s something which will help this country prosper, over time.